For many years CHQ Chairman Richard A. Viguerie has been pointing out that there are no “conservative” Democrats left at the national level. There are some smart politicians, such as West Virginia’s Democratic Senator Joe Manchin, who try to look conservative by giving lip service to some conservative issues. However, when push comes to shove, say on defunding Planned Parenthood, rather than risk being marginalized they side with their Far-Left liberal leaders California Rep. Nancy Pelosi and New York Senator Charles Schumer. And the same dynamic is now at work further and further down the Democratic Party’s food chain, as a recent report from Pennsylvania demonstrates. Salvas said he believes football players have a right to protest, but he refuses to apologize for his personal stance on the national anthem. 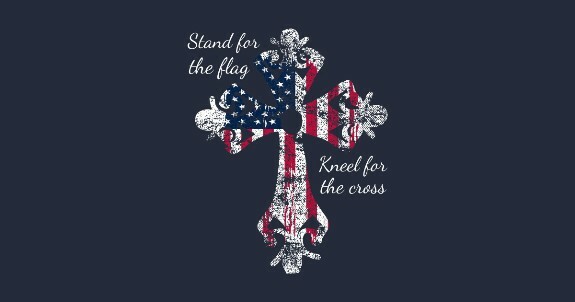 “I stand for the flag, I kneel for the cross,” he declared. “No apologies,” the reporter asked. “Not at all. Not at all,” the former Democrat leader replied according to Starnes’ report. Starnes says Salvas said party leaders were also upset over an item his wife posted showing support for a police officer accused of killing an African-American. Salvas said they had known the police officer and his family since the officer was a toddler. “They have been there for us in hard times, and my wife and I felt it was necessary to be there for them because family backs family,” he told the television station, according to reporting by Todd Starnes. Pennsylvania state Rep. Ed Gainey (D-District 24) accused Salvas of offending African American voters. This is just one example of how the Democratic Party has become the Party of radical secular liberals and race-baiters, such as state Rep. Gainey. When the Democratic Party scrubbed the mention of God from its platform and delegates to the Democratic National Convention booed any mention of God it was clear to most movement conservatives that Democrats had become the official party of the anti-religious Left. What was not clear then, but is crystal clear now, is just how vicious and deeply personal the Democrats’ war on professing Christians, Christian values and Christianity in general would become. What are the political ramifications for Democrats? Submitted by email_registrat... on Tue, 10/16/2018 - 11:30. Maybe the Republicans should extend a welcome to Mark Salvas. We're happy to have patriots that know the value given and meaning portrayed by Our Flag. ANTIFA has their own. Maybe the Democrats should too since they are leaning so far left that they seem to be falling into the arms of socialism. Please, keep going left until you reach California...then keep going.